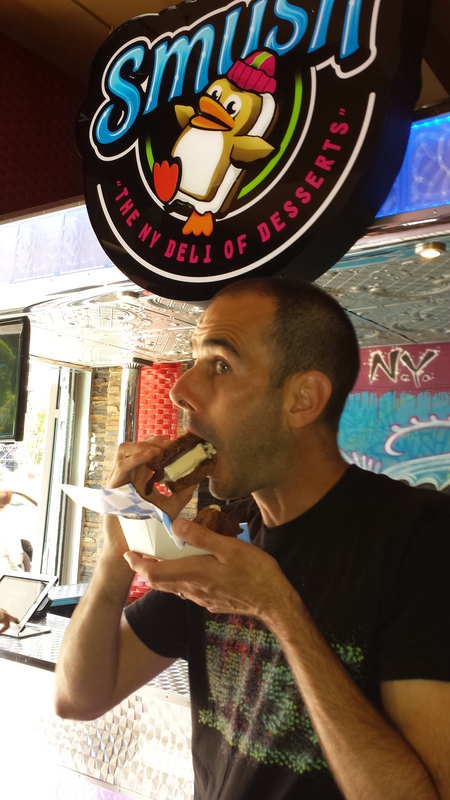 I’m not an ice cream sandwich connoisseur and I don’t travel the globe sampling the best ice cream sandwiches, so it might not be fair to say that the best ice cream sandwich you’ll ever have can be found at Smush, but I bet you would have a difficult time finding one better. The ice cream sandwich that I had there was, by far, the most delicious one that I’ve ever had. Smush operates by letting you order from a list of predesigned sandwiches or you can create your own. If you choose to create your own, and I highly suggest you do, you’ll have a lot of decisions to make. Here’s how it works. You get 5 choices to make your perfect sandwich. 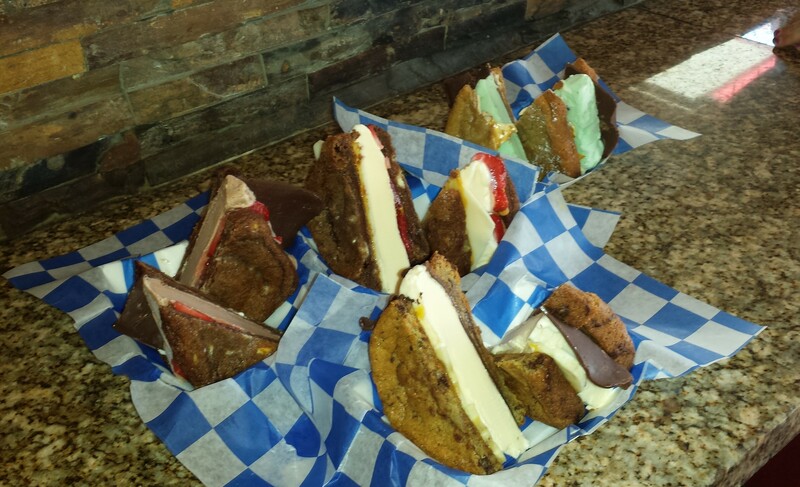 Choice 1 – Cookie: You get to choose from chocolate chip, red velvet, french toast (snickerdoodle), brownie, etc. Choice 2 – Spread: Your spread options are nutella, marshallow, peanut butter sauce, and caramel. Choice 3- Topping: You can only choose 1 topping, but it will be the only one you need. Sliced strawberries, bananas, potato chips, and pretzel pieces make up your toppings. Yeah, I said potato chips. Choice 4 – Ice cream: You can either choose the flavor of the day (mint chocolate chip on the day we were there), vanilla, or chocolate. 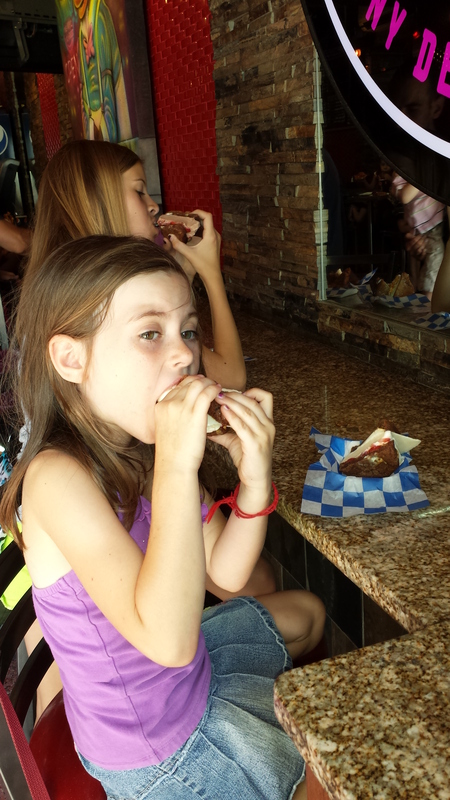 Choice 5 – Fudge: As if you don’t have enough on the sandwich, you get to add fudge to it. Your choices are milk chocolate, white chocolate, swirl, Andy’s Mint, and Strawberry Cream. After you make your choice, you get to watch your ice cream sandwich be assembled into art as the fudge, ice cream, and toppings are sliced like you would see at the best NYC delis and placed between two bread-shaped cookies. I can’t praise this place enough as a fun treat destination. From now on it will be a stop for everyone that comes to visit me. My one complaint and I’ve always got one is that there isn’t much room to sit inside, but who wants to sit inside anyway, when you can grab some shade in lovely Union Square. Of course, if you do that during the summer you’ll have to eat quickly before the ice cream melts, but most people can’t help but to chow these sandwiches down quickly anyway. Just found out that Smush is closed for the winter.